The student affairs market has experienced a great boom in the last decade. Based on the fourth edition of the indispensable guide to the laws that bear on the conduct of higher education, this updated student affairs edition provides a reference and guide for student affairs practitioners and graduate students in student affairs administration courses. This volume combines sections that are pertinent to student affairs practitioners, as well as the government regulatory and administrative issues found in the full Fourth Edition. 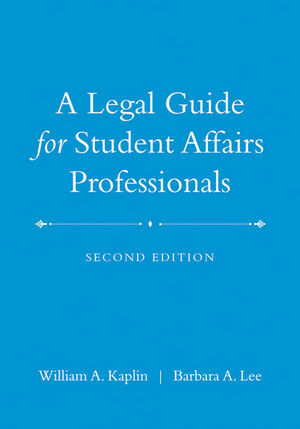 It is thus the most comprehensive and easy-to-use volume for student affairs officers and students. WILLIAM A. KAPLIN is professor of law emeritus at The Catholic University of America, Washington, DC, where he also served as special counsel to the Office of General Counsel. He is now senior fellow at the Center for Excellence in Higher Education Law and Policy, Stetson University College of Law. BARBARA A. LEE is professor of human resource management at Rutgers University’s School of Management and Labor Relations and of counsel to the law firm of Edwards Wildman Palmer. An attorney, she teaches employment law and higher education law. Together they are the authors of The Law of Higher Education, now in its fifth edition.